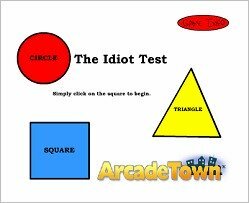 The Idiot Test is a simple, challenging game that trains concentration and visual attention. To begin, click the Small, Medium, or Large link or Very Large button under the picture at left. This opens the game in a pop-up window. The HTML5/Mobile version works on desktop computers, tablets, and phones. Follow the on-screen instructions. Make one mistake, and the game calls you a fool! HOW TO PLAY. Read the instructions on each screen of the test, and carefully follow what they say. If you don't want to be called a fool, perform each instruction very carefully. That's the only guidance I'm allowed to give you. You'll need to use your own intellect, perception, and concentration to beat this game. To begin, click the blue square on the first screen. Brainiacs Who Passed the Idiot Test. If you make it to the end, tell me what the final screen says and I'll post your name on this page! Also tell me the name of your city and country. Feel free to mention your last name as well, if you want it included. You can reach me by sending a message through my Contact Me page.